Long periods of absence are becoming an issue – I know! But once again I’ve returned from the darkness with this quick little update on my sketch progress. Long story short, I started drawing cars with a vengeance this past summer and I was actually starting to feel like that I was making some real progress before I hit a creative wall in late September and called it quits for a bit. I knew that I wasn’t going to stop drawing cars for good, but sometimes I feel like I can’t draw anything no matter how hard I try and the frustration grows to be too much. But I’m back! I’m feeling the itch to draw again and I’ve been doodling a bit over the past few days trying to get back into the swing of things. Since my last post, I’ve grown to like Photoshop for these kinds of sketches quite a bit. I feel like I can lay down thicker and more solid lines than I can with Sketchbook Pro, and since it’s the program I’m most familiar with than anything else, it’s easy for me to move quickly and do what I want to do without struggling trying to find the proper tools. The only thing that I don’t like (that I’ve talked about before) is the awkwardness of drawing circles and ovals for things like wheels and headlights. Sketchbook Pro is much (much) better for that kind of thing. I’ve also given up slightly on Manga Studio. It is a really good sketching and rendering program – but to be honest I don’t think it offers anything more than Photoshop or Sketchbook Pro for the money. If someone gave it to me for free I’d certainly use it, but at this time I don’t think there’s enough of an advantage for my drawing style to make it worth it. 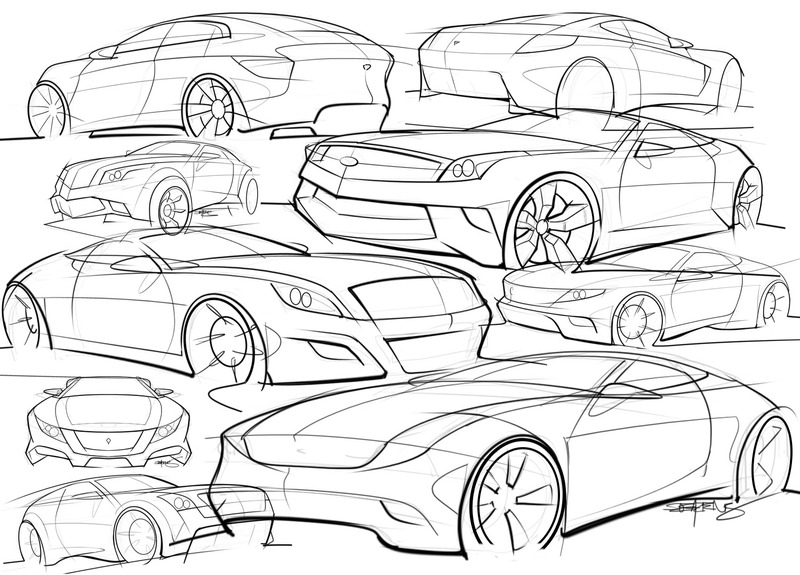 Anyway, the sketches at the top of this post are some of the cars I drew over the summer. I’ll be posting more recent stuff in the coming weeks as I get back into a rhythm and start drawing again. Even though I feel like I’ve taken a slight step back by taking a break for a few months, I can see definite progress from where I was at a year ago. That’s encouraging! hi scott, do you do commissions? Hey Nate – sorry for the late reply (I’ve been so busy with other projects). Anyway, I’m not doing commissions right now, but please do check back some other time. That may change depending what else I’ve got going on. Have you ever tried to enter branding contest . Well, that’s basically what I do in my day job! 🙂 I’m a visual designer with many clients (many of whom I do branding for) and it’s really fun. 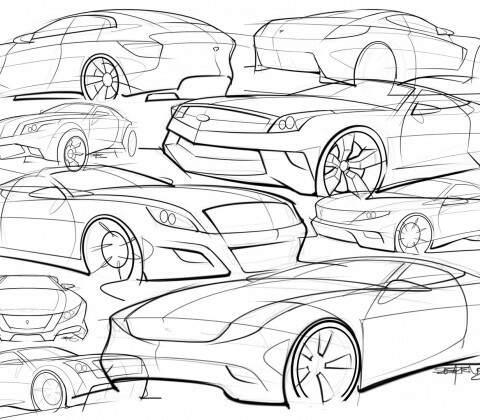 Drawing cars is a lot more fun though!